This past Saturday we dropped Adrienne, Olivia and Sawyer off at her mom’s. One of her sisters is in town to help take care of my Mother-in-law, who just had knee surgery. Camp Williams is where the Katrina refugees, that came to Utah, lived. It is located right at the edge of Salt Lake and Utah Counties. From there, we headed over to see Camp Floyd. Camp Floyd, at one time, was the largest military installation in the United States. You can’t tell it now. There are, maybe, 75 people who live in Fairfield now. It was a nice few hours of just catching the sites near my in-laws with the boys. 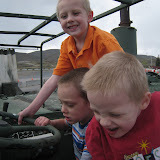 We plan on heading up to Hill Air Force Base this summer to see the Air Museum. Camp Williams and Floyd was published on April 23, 2007 by Jared Ottley.